"Are you embarrassed that you're far from perfect? Well, don't be. Not Me! 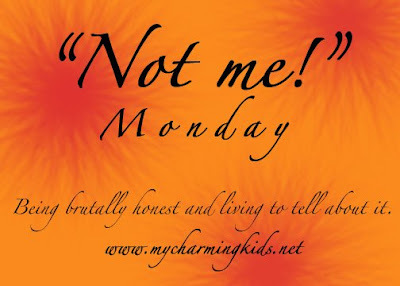 Monday was born out of my desire to admit some of my imperfections and and reveal a few moments I'd rather forget. You may find it therapeutic to join in and do the same." Last week I most certainly did not leave both of my children for a week long trip with the hubby to Washington, D.C. No, not me. I most certainly did not work myself up about the flight to the point of vomiting in front of the drop off area at the airport. No, not me. After arriving in D.C., I absolutely did not see a purse in the airport that I had to have, but was rushed off by my endearing husband and his itinerary. I then most certainly did not remind him periodically throughout our trip that we had to get to the airport in time for me to find the store again. Oh no, not me. I didn't have such a headache later that night that I went ahead and ordered food in downtown Alexandria and then refused to eat it. And I certainly didn't proceed to be a crabby patty because I didn't feel good until we left early and headed back to the hotel. I then didn't vomit (yes, again, I mean, no, not me) all over the sidewalk.... in public... during rush hour..... then take a wrong turn on the way to the hotel, have to backtrack, and then see the owner of the car I just vomited in front of in utter disgust. Oh no, not me! I didn't miss my kiddos so much that when Anna called to tell me Happy Mother's Day that I teared up in front of the Washington Monument and secretly wished to be back home with her. Oh no, not me. After arriving 2 hours early to the airport to return home I must say I was quite excited to have plenty of time to find the store with the purse..... after we ate breakfast. And we most certainly didn't cause a scene at the airport McDonald's when they got our order wrong, then blamed us and tried to charge us more money. And I most certainly didn't insist on sitting down to eat only to realize that we had very little time left to find the store with my purse... then proceed to be a crabby patty running around the airport trying to find it...... oh no, not me.... but I must say, I do love my new purse. Crabby Patty no longer! Come over to Toot Your Horn Tuesday. A fun follow-up to these Not Me's.